The exhibition Water Projects at the Santa Giulia Museum in Brescia, Italy, has been conceived as a complement to Christo and Jeanne-Claude's The Floating Piers installation that will be open to viewers on the nearby Lake Iseo from June 18 to July 3, 2016. Water Projects is curated by Germano Celant and features over 150 exhibits comprising original preparatory studies, scale-models, photos of the finished projects, videos, and films. Christo and Jeanne-Claude. Water Projects presents a chronological display of the artists' works since the early Sixties. 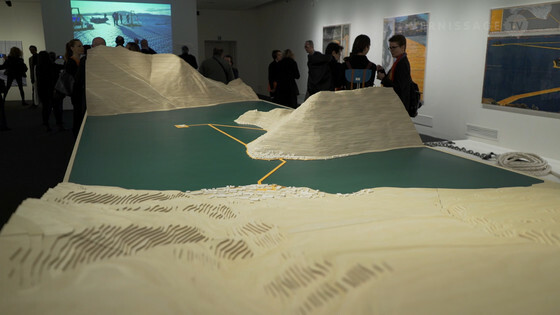 The exhibition illustrates their seven Water Projects, from Wrapped Coast, One Million Square Feet, Little Bay, Sydney, Australia, 1968-1969 to The Floating Piers, Project for Lake Iseo, Italy, 2014-16. The exhibition will also include an informative and interactive section opening in June, documenting the Lake Iseo environmental art project in the making and a live streaming of photos and videos posted by the viewers visiting the installation on the Lake. The exhibition Christo and Jeanne-Claude: Water Projects at Santa Giulia Museum in Brescia, Italy, runs until September 18, 2016. Christo and Jeanne-Claude: The Floating Piers, scale-model.